Smoky from the cumin with a hidden serving of vegetables, this dip is equally delicious in a burrito as it is spread on tortilla chips. Smoky from the cumin with a hidden serving of vegetables, this dip is equally delicious in a burrito as it is spread on tortilla chips. I spread this on bread or tortillas with vegetables for a quick sandwich, I dip carrots and celery into it, and I eat it with tortilla chips for a snack. 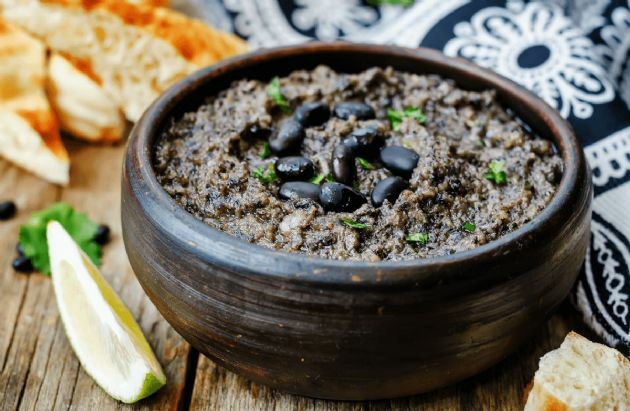 Drain and rinse black beans if using canned. Place olive oil in skillet set over medium-high heat. Add onions, peppers, and garlic and saute about three minutes, until vegetables are fragrant and starting to brown slightly. Add cumin, stir well, reduce heat to medium and cook another two minutes. Place beans in food processor and pulse several times. Add vegetable mixture and pulse a few more times. Add vegetable broth in small batches to thin the dip to the desired consistency. Garnish with chopped cilantro. Serve immediately or store in refrigerator for up to 10 days.